In September dozens of German leftists gave the invading Muslims a hero’s welcome. Several German women were sexually assaulted at a “Welcome Refugee” party in Bonn. Oh, the irony. 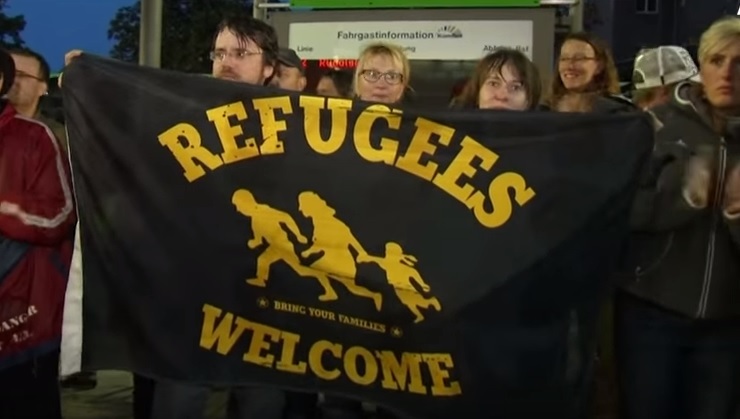 An association called “Refugees Welcome Bonn e.V.” organized a refugee welcome party. But then these do-gooders met the Islamic culture: the Muslim migrants sexually molested the women at the party. And still the running dogs for Islam on the left continue to lay down for them (literally). You can’t make this stuff up. Refugees Welcome Bonn e.V. wants to comment on the incidents that happened on party on the Township on Nov. 7th and was co-organized by our group. At the party we observed that some men molested, touched and harassed women. As co-organizer we want to apologize. During the party we tried to identify the offenders and make them leave the venue; also we made announcements where we asked to stop this behavior immediately. However, these measures were not successful. We apologize for that! Those men cast a negative light on our organization as well as on all men and male refugees, who were at our party. […] instead of just adversely pointing fingers at those who misbehave, we believe it’s as important for everyone in our civil society to tackle these differences in the daily integration. For that reason we will increase our efforts to give no space to such behaviour during our upcoming parties and other events. We believe it’s essential to treat each other with respect and share the idea of a general equality between all human beings. That necessarily includes, akzepting [sic] a “No“, when making advances to somebody, instead of forcing your will on another person.